There's a great playground just a block from our house. 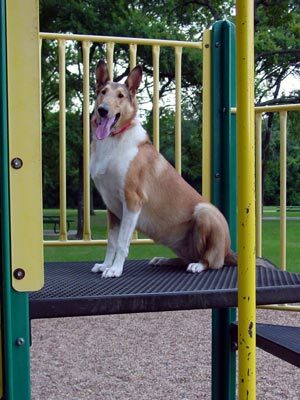 Splash loves to show off on the playground equipment. The neighborhood kids always like it when she plays on the slide! In April, we went to Washington state for RJ's grandfather's funeral. We were doing a two-week driving trip, so we took the dogs with us. The dogs stayed in the car during the funeral service, but we left them out to play in the church yard afterwards. There was a lunch reception after the funeral, so people were going in and out of the church with plates of food. Splash decided that she wanted to be where all the people (and food) were, so when a gentleman held the door open for two ladies to go outside, Splash trotted into the church just like she belonged there. She spent several minutes checking the place out, and people were talking to her and petting her. RJ heard her collar tags jingling, so he caught up to her and took her outside. When he apologized to the pastor and several people inside, they just laughed and said that Splash was very well-behaved, and that having a dog in the church made it feel home-like. It brings a new meaning to the idea of a welcoming church! 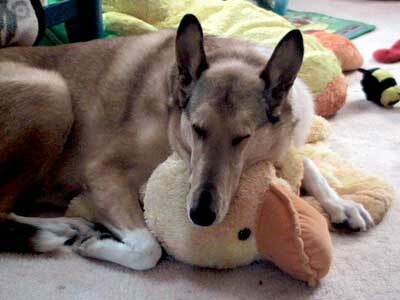 Splash has an affinity for stuffed ducks. She found Micaiah's duck blanket and decided it was the perfect spot to take a nap. Christmas came a bit early this year, and Splash got her big present already. We made big comfy beds for each of the dogs. As soon as we finished Splash's bed, RJ called her over and had her lie down on it -- and she snuggled in and stayed there for hours! Splash isn't sure about all the construction going on in the house. We're remodeling, and Splash doesn't like the loud noises of hammering and drilling. She really doesn't like the dust and dirt of demolition, and she gets very disconcerted when we take out walls! We try to be careful about picking up debris and nails, but the dogs have learned to be careful when they're in the construction zone. When we start working, Splash goes to our bedroom and curls up on her bed! RJ spent the month of October at the Trailhead Wilderness School base camp, doing therapy with adjudicated teenage boys. It meant driving to Leadville (2 hours each way) every weekday, which wasn't much fun, but Splash got to go to work with him. She loved all the attention from the boys, and just "hanging out" with RJ. 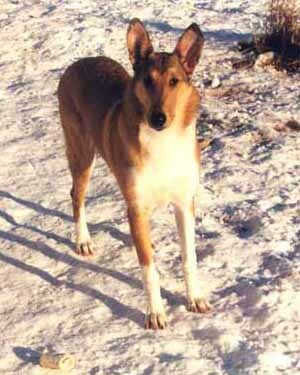 A lot of the boys are starved for affection, and really enjoy the undemanding attention that collies are so good at. We keep thinking that we should start doing real therapy work with Splash, and visit nursing homes and hospitals, but we just don't have the time. We've been taking a break from formal training. Splash is perfecting her cuddling and lounging skills -- she's quite the couch potato! Between moving, buying a house, and starting new jobs, Splash's formal training has had to take a back seat for a while. Splash and Ranger are both happy and healthy, even if Splash is a bit "fluffier" than she really should be -- RJ swears it's fluff and not fat that is making her hips wider! 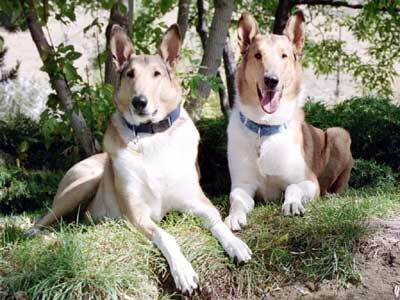 We go for hikes and bike rides as often as we can, and both collies loved it when we went camping in July. They had a blast running around the old Pieplant mining site with their husky friends, Rock & Cairo. The Princess wasn't thrilled with sleeping outside, though, and she kept trying to climb into my hammock at night! The Princess and the pea is nothing compared to Splash and her dog bed! Ranger can sleep anywhere, in any position, but Splash prefers soft beds. I'm sure she'd like satin sheets! Splash has a great time at the playground! 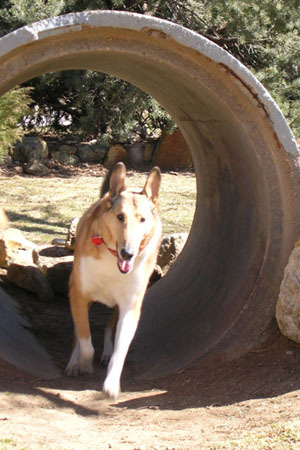 Splash loves training in agility and obedience. Her favorite place to practice is the park! She and RJ have a great time on the playground equipment, running up the stairs, across the bridge, and down the slides. 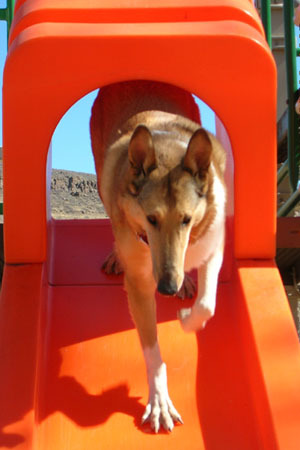 It's a lot of fun -- and also a good time to work on obedience and agility! Splash always gets compliments from other people at the park, and really enjoys playing with neighborhood kids. RJ is concerned that Splash could be getting "burned out" on SAR work, so they're taking the summer off from SAR training. For a change of pace, they're doing intermediate agility classes -- with doggie friends Zip & Safari, so it should be lots of fun! Splash is now officially a Canine Good Citizen! She passed the AKC CGC test on the first try. Admittedly, she was a bit noisy during the "stay," but she's always noisy! Splash is learning to search for multiple victims now. She has a very strong work ethic. Even if she's tired, when RJ asks her to "Search," she keeps on working. She goes through mud, brush, and anything else -- although, like any lady, she doesn't mind when RJ breaks the path for her! She is definitely Daddy's Girl! One of her nicknames is "Princess," because she's so dainty and refined. But, that all changes when she's searching! Splash and RJ passed their Level III SAR test! This was the night test -- 80 acres, at night, within three hours. Splash's nose works just as well at night, of course, but working at night is harder for the handler. They did a great job! The next test is the fieldability test -- two victims, 160 acres. RJ and Splash will be spending some time training obedience and agility for a little while, just for a change of pace. Splash and RJ passed their Level IV SAR test! Splash was absolutely wonderful! She searched 40 acres, and found the subject within 20 minutes. She did a really good job of searching -- she definitely knows her job, and thoroughly enjoys it! RJ was not nearly as nervous this time, which also made a big difference. They're already on the waiting list to take the Level III (Intermediate) test. SDN's Beginning Wilderness Air Scent (aka Level IV) test is actually the equivalent of the national standard for fieldability (according the NASAR, the National Association for Search & Rescue). With most teams, NASAR standards are good enough. 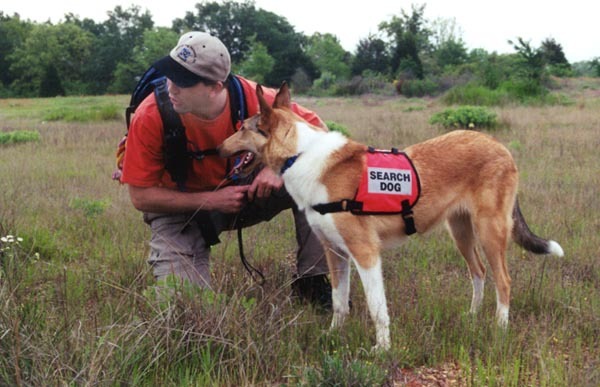 Search Dog Network just has higher standards, so the team has to pass two tougher tests to be fully fieldable. Splash is an extremely good big sister to Ranger, who arrived on December 12. She even lets him win at tug-of-war (sometimes)! They're very cute together. It's been a long, hot summer! We cut back on training because of the Texas heat, and Splash has enjoyed the additional emphasis on playing and conditioning. We're up to over 2 miles in our daily runs/walks, and we've also spent a lot of time on basic obedience. Splash and RJ will be retaking their first SAR certification test in the next few weeks. 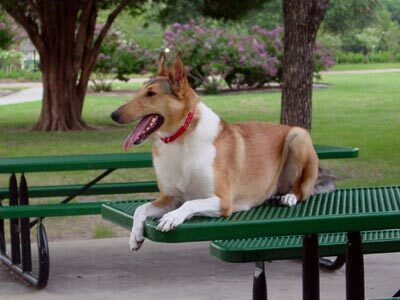 Splash and Nik spent the weekend at the Astrohall Dog Show in Houston, the world's largest AKC show. They were representing SDN at an info booth. Splash met lots of people, and generally had a good time. SDN's booth was right next to the Collie Rescue booth, and they all had to come meet her once they found out she was a Kings Valley dog! Splash and RJ had their first SAR test today, but unfortunately, they didn't pass. They found the victim, but were ten minutes over the time limit (one hour). So they failed on the technicality. Splash did an excellent search, though! It was tough, with lots of brush & briars, but she kept slogging through it. RJ didn't run the search pattern like he should have, because he was nervous -- he didn't sleep at all the night before! The victim was on the downwind edge, in the brush, and RJ had left that area until last because of the dense brush. He'll never again forget to run a perimeter before doing a grid! It was a really good learning experience for both of them. Splash did a good find and a clear alert, and she has no idea that she didn't pass the test -- so she's happy. Not passing is not a big deal, and they'll retest when the weather cools down. Splash is doing great, and we hope to be doing her first SAR certification test this summer. She's done an 80-acre search at practice! She worked for over 30 minutes, and found the victim. It was a tough search, too, as it was humid with no wind and a lot of crosstracks. We're really being careful not too push her too hard, and we always make it lots of fun -- and she loves it! She has a great bark alert, which is very important. It's easy to tell when she has found her victim. RJ is working on directions and distance commands. Splash will go the direction where RJ tells her, then stop and sit on cue. She is progressing to more difficult commands, such as "up" to jump over an obstacle -- one of their favorite games is for RJ to direct Splash around the house, getting on and off the furniture! Splash's new search vest arrived in mid-March, and she's learning that when they vest is on, she is working. She is such a "nudist" (she hates to wear anything!) that we were worried about how she would react to wearing a vest. We got the smallest, lightest vest possible -- it's actually called a "search bikini" :-) . We put a great deal of effort into making the vest a "good thing." Every time we put it on her, we would play and have a great time. It worked well, and now she gets very excited and happy when RJ puts it on. It's just another cue telling her that we're going to play the search game. Splash's training is progressing rapidly, and she's making huge progress for her age. It's easy to forget that she's less than 10 months old! 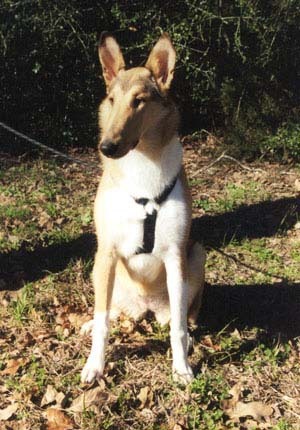 Her search tehcnique is natural, and she instinctively uses the wind, quartering back and forth to pinpoint scent. When the wind isn't blowing at all, she's learning to put her head down and trail until she finds a path. She understands directions, and readily follows RJ's hand signals to tell her which way to go. She is still young, so she's still distracted sometimes, but even that is improving. The Texas weather is starting to warm up, so we were very glad that she's made so much progress this spring. Once it gets hot, we'll really have to cut down our practice time. Splash is advancing rapidly in SAR training. 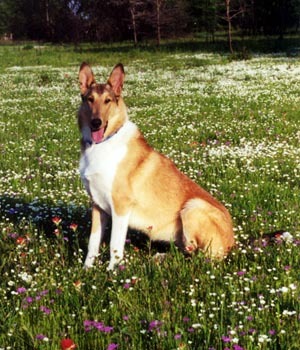 As a herding breed, she started out using sight to find the hidden person -- and SAR work requires searching by scent. We continued to work on obedience and SAR basics, waiting for her to grow up a little more. Then the lightbulb suddenly clicked on in early February, and she realized what the "search game" is all about. In one day, she quickly advanced from beginning puppy runaways to out-of-sight runaways on a stranger. She is now using her nose almost exclusively, and is even beginning to quarter back and forth against the wind to find her hidden person. With these advances, RJ has started to work on the next stage of training, the refind. Splash is now learning to find the person, bark, then return to RJ to get her reward. Once she gets this down, she'll learn to bark to alert RJ that she has found the hidden person, then lead RJ to them. Splash is usually vocal, and naturally barks at the person when she finds them. She is also learning to "speak" on command so that she will have a clear alert to tell RJ when she has found a hidden person. Splash went on her first road trip, and got to play in snow! We traveled "home" to Gunnison, Colorado to ski and visit friends. Splash met her husky "cousins," Rock & Cairo Adams. She learned about snow and generally had a great time! After over 2,000 miles in the car, she's now an accomplished road-tripper. Splash has missed SAR training for most of the fall because of a skin problem. She couldn't get wet or dirty for six weeks, and with all the rain we've had lately, that pretty much eliminated SAR practice. Splash loves water and mud, so we've had a tough time keeping her clean! We did puppy kindergarten for 8 weeks, and worked on lots of obedience. We were fostering an 8-month old Catahoula, Rainy, so Splash wasn't getting as much training as she would otherwise. Rainy went to her new home this weekend, so things should be better. We definitely do best with only one untrained pup at a time! Once Splash could get muddy again, she made up for lost time! Those paws are supposed to be white! 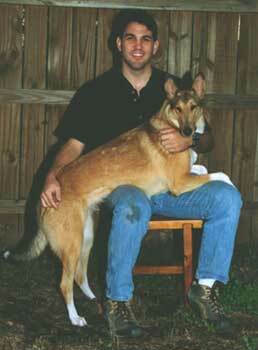 Nik brought Wiggles home from Kings Valley, Oregon on August 25, 2000. After several days of debate, we decided to name her Splash of Gold because she likes water and she has a splash mark on her ruff. As an adorable puppy, Splash charmed everyone on the plane. After two long plane flights and a two-hour drive home from the airport, she immediately made herself at home and part of the family. She is wonderful. 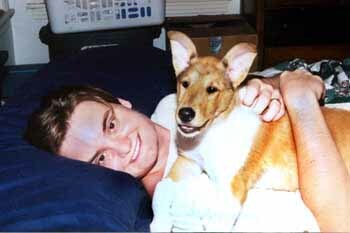 Splash cuddling with Nik -- they both slept for 16 hours straight after the trip home! Leslie called just before midnight Wednesday. We can have Wiggles. I've already checked on plane tickets. We can't ship her because of the hot weather, so I'll have to fly to Oregon, pick her up, and bring her home with me on the plane. I have to be at the Austin airport by 6am Thursday, and I'll be home by noon on Friday. It's a fast trip. Eva & Leslie called today. They must have said, "we know it's sooner than we thought, but Wiggles is just ..." at least a dozen times. 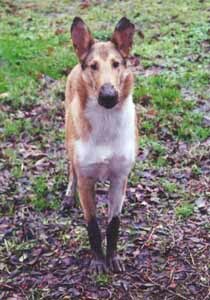 We've been talking to them about getting a new puppy for SAR, but we didn't think a pup would be available until spring 2001. Many of their pups become Guide Dogs, so we have to wait for one to become available. 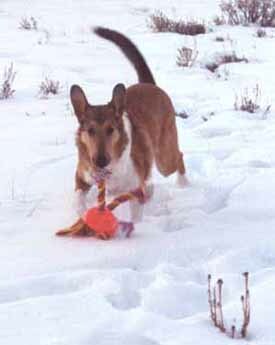 Eva & Leslie know what we need for a SAR dog, and Wiggles is just ... perfect. She's smart, fearless, vocal, and she loves to get into everything. 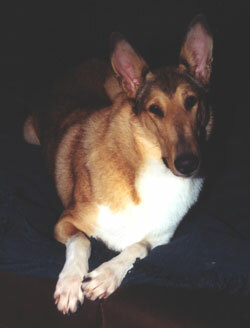 She's a sable smooth coat. She may be a Guide Dog, but if the Guide Dog trainer prefers a male pup, then we can have Wiggles. We're praying and waiting. We'll know by Wednesday. Splash and littermates, chowing down at 18 days old. 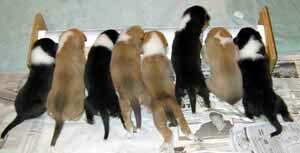 Facing the front, Splash is the 4th puppy from the right (between a tri-color pup and a sable pup).